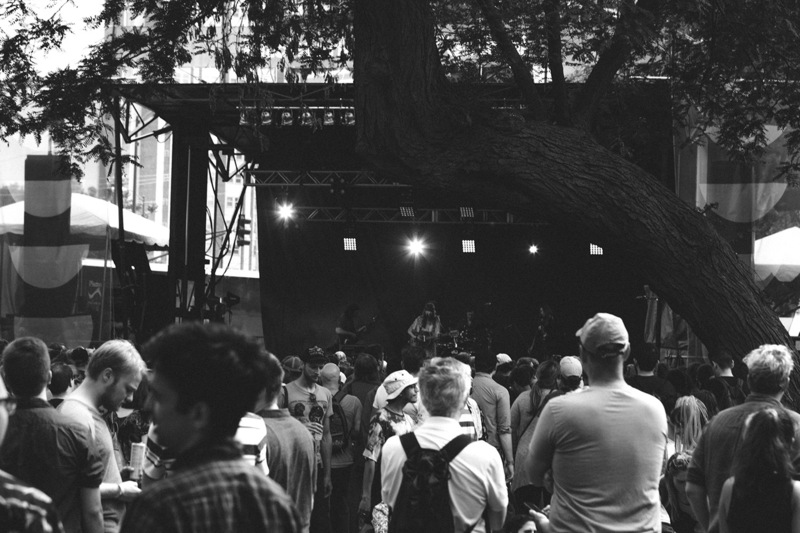 Since 2005, the annual Pitchfork Music Festival, held in Chicago’s Union Park every July has wowed fans. The festival has great music curation and has built a solid fanbase, and the various musical genres attract new festival goers every year. 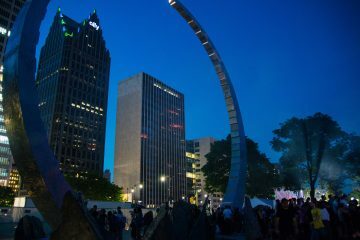 PMF is one of the best new music festivals in the Midwest. The light rain that fell throughout Friday and Saturday didn’t stop anyone from taking the stage unlike at past festivals, and clear skies prevailed on Sunday. In fact, festival goers and artists alike seemed to embrace the change in weather. Three enormous stages with lots of open space greeted us. There were local food trucks, vendors, and even an indie records labels area. We loved the vendors and just wished we had more time to explore the area. We could have taken an entire day just for them. In the beginning of the festival, the only water available was from a single founatin; however, after receiving feedback from festival goers the Pitchfork organizers reacted fast, albeit a bit late, and set up watering stations for Saturday and Sunday. Julie Byrne: Hailing from Buffalo, New York, this gifted folk singer, songwriter, and guitarist has an eloquent style. Backed by a violinist and a synthesizer, her hushed guitar and singing gave an intimate performance. Tierra Whack: A last minute addition to the festival after Earl Sweatshirt canceled last minute, Whack’s 90’s vibe mumble rap was free-styled with rapid delivery. Tame Impala: Conceived by Australian multi-instrumentalist Keven Parker, Tame Impala’s style is psychedelic rock. While we didn’t see as much energy on the stage as expected, that energy would have just been a distraction as the songs really washed out all other senses. It’s been three years since their last album Currents, they are a major band who has managed to maintain their “new indie” vibe, instead of becoming just another psych rock band that got too big. Zola Jesus: This was one of our favorite sets. Sounds varied from haunting ambiance to 90’s alternative, to industrial-tinged electronica. While there wasn’t much crowd interaction, we considered this a good thing because the low-key vibe allowed listeners to absorb the deep lyrics in the tracks. Kelela: She had a hypnotic element to her set in a style that was electronic influenced R&B. The theme to her songs was love–receiving and giving. It was hard not to compare her a little bit to FKA Twigs, a Pitchfork alum. Blood Orange: Also known as Dev Hynes and formerly known as Lightspeed Champion, this british producer, songwriter, and multi-instrumentalist was fantastic live. He performed songs that spanned his entire catalog and even improvised, which made his performance special. He even played some unreleased tracks, 80’s and 90’s pop. He had unbelievable charisma and this is one set we didn’t want to end. The War on Drugs: A Philadelphia indie-rock band led by co-founder and the primary songwriter/guitarist Adam Granduciel, this set was definitely a fan favorite. All songs played were from their 2014 album Lost in a Dream, or last year’s grammy-winning A Deeper Understanding. They played nine songs with extended renditions to most. Kweku Collins: An Evanston, Illinois, native, Collins had high energy as he moved around the entire stage. His songs varied in style in a versatile spectrum of singing and rapping. Kelly Lee Owens: A Welsh musician and producer, Owens released her self-titled first album last year. While her style has been described as dream pop, or techno pop, what we heard sounded more like raw Detroit techno, which was a nice change of pace compared to the more subdued acts. Ms. Lauryn Hill: She performed her groundbreaking solo album The Miseducation of Lauryn Hill, released 20 years ago. We were expecting a delay, but Hill was only 23 minutes behind schedule. While there were some technical difficulties with the sound which was somewhat distracting, Hill delivered with both vocals and performance. Her set made for the perfect ending to this year’s Pitchfork Music Festival.